Do you aerate your lawn? I recently started looking into ways of making my lawn more lush and healthy and what I learned is that aerating your lawn if really good for it. Aeration helps to create openings in the turf and soil that allows water and air to penetrate the roots of your grass and makes them healthier. This in turn, turns your lawn into a lush, beautiful green blanket that would rival any golf course. So, when I found out how good aeration is for my lawn, I started looking into aerators. Let me tell you, a lawn aerator is not cheap. Even the seemingly cheaper ones are pretty costly, so what did I do? I started looking for DIY lawn aerators. I found seven great DIY aerators that all work perfectly to make your lawn lush and beautiful. Whether you want something that is going to cover a lot of space at once or you just need something simple that will allow that air and water to get to the roots of your grass, there is a DIY lawn aerator that is perfect for your lawn. And if you haven’t yet, be sure that you get a look at these 12 near genius IKEA hacks for your lawn and garden. Now, back to aerating those lawns. This is a really simple process and it can be so healthy for your lawn. And, when I say simple, I mean it. 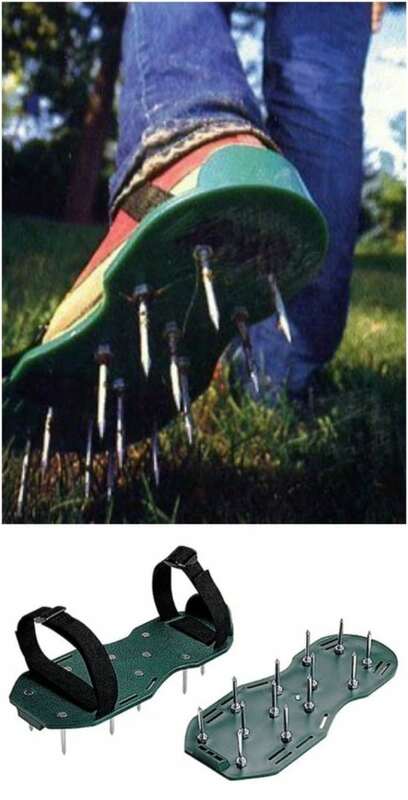 There are even a couple of DIY versions of lawn aerating shoes! You just slip them on your feet and walk around the yard to aerate it. How simple is that? If you really want a beautifully lush lawn this year, I highly recommend that you check out these DIY lawn aerators. And, be sure that you check out these 100 gardening hacks and pro tips that will definitely make you an expert. This DIY aerator is made from a five gallon oil drum and it’s pretty simple to put together. Once the spikes are in place, you add a handle and wheels and then just push the aerator through your yard to keep your soil and grass healthy. This one is so simple and can be really cheap if you have an old oil drum that you can use as the base. This DIY lawn aerator is very cheap and easy to make. 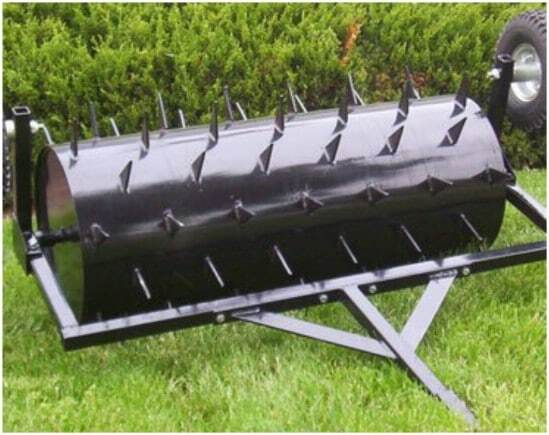 The spikes are made from nails, which are perfect for creating the aeration that your lawn needs to make it grow lush and healthy. This one is also a push aerator so you add a handle and then just push it throughout your lawn to help it to grow. It will only take you a couple of hours to put together and begin using it. I really love creative DIY concrete projects! Why spend hours pushing a lawn aerator when you can simply walk around your lawn and get the same result? 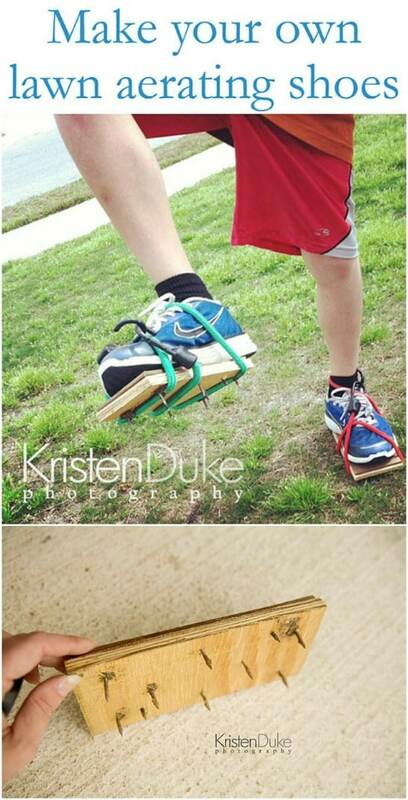 These DIY lawn aerator shoes are honestly the easiest things you will ever see. You just need a couple of pretty thick boards and some nails as well as something to secure your aerators to your shoes. You could do a few of these in different sizes and have the entire family walking through the yard to aerate it. Here is another quick and easy take on lawn aerator shoes. These little sandals are made from plexiglass and they are super easy to put together. They work just like you would imagine…you strap them to your feet and then walk your way to a beautiful lawn. Make a few pairs and let your family or friends help you to make your lawn healthy and lush. These are also really cheap to DIY. You don’t need any fancy equipment to aerate your lawn. 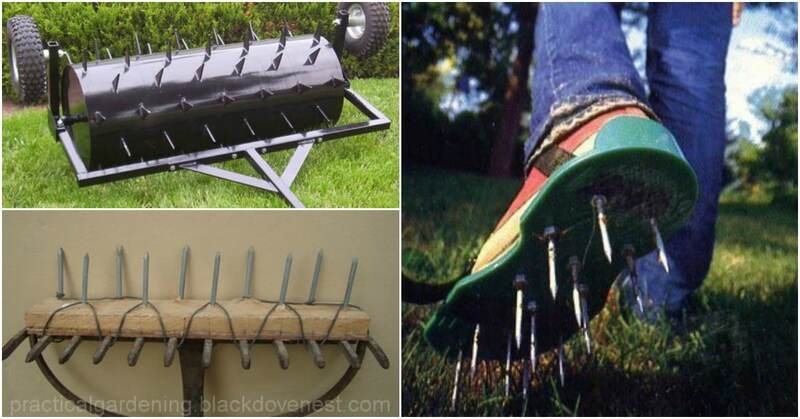 You can make a simple DIY lawn aerator out of an old garden rake and a 2X4. I do love good 2X4 DIY projects and this one is fabulous. You just use the rake to steady your aerator and give yourself a brace for pushing it into the ground. This one honestly will only take you an hour or so to make and it is really easy to use, too. 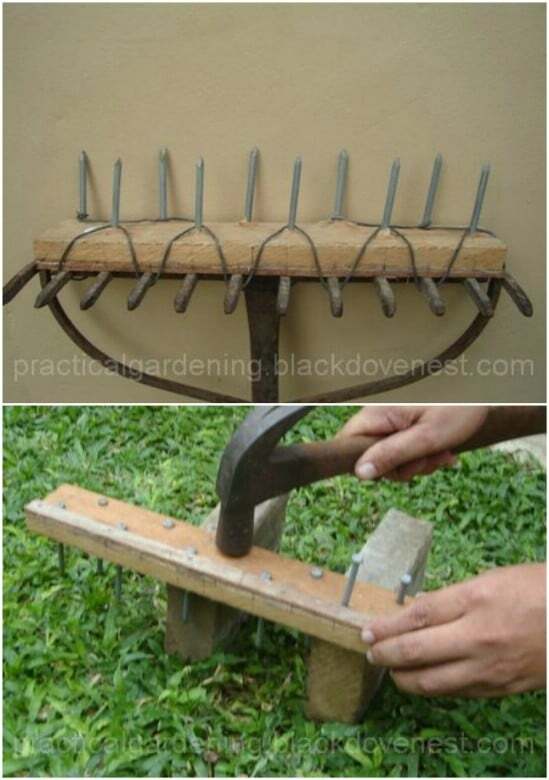 What a great way to make use of old gardening tools! 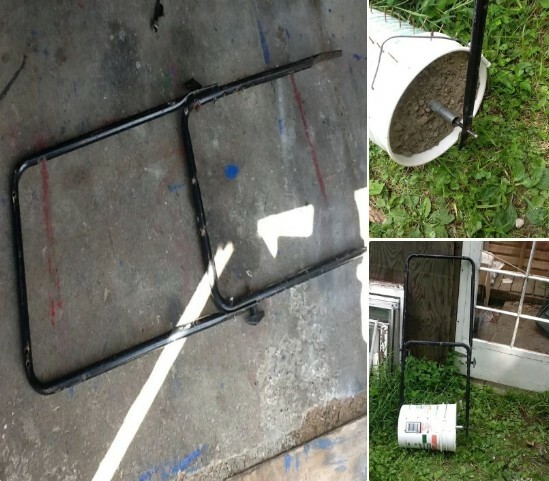 This homemade lawn aerator is made from an empty five gallon bucket and it is really simple to put together. This is a great upcycling project for those empty buckets. You just need the bucket, a few nails and something to use as a handle – an old handle from a push lawn mower would be perfect. You just assemble and then push the aerator around your lawn to give it that great lush look. You can make this simple DIY lawn aerator with strips of reclaimed wood. You just have to find a base – PVC pipe filled with sand or concrete works well – and then add your strips of wood. The wood houses the nails that you use to aerate the lawn. You can add a handle from an old lawn mower or something similar to make pushing it through the yard simple. This one only takes a couple of hours to make and it works like a charm.